A metal object, not further defined, lies on a table. A mechanical construction is attached to one of the table edges. 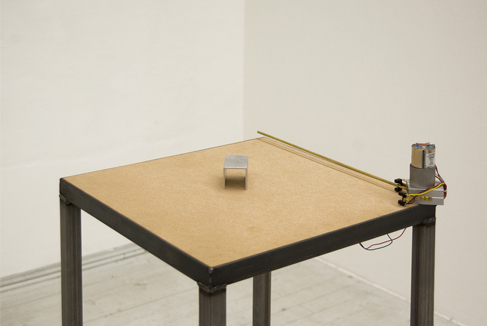 Using a motor and an arm, every two hours this construction throws the metal object to the floor. The object that is thrown down has to picked up by the caretaker and placed back onto the table. Today industrial manufacturing is nearly purely mechanical work, only supervised and overseen by humans in order to make the smoothest mechanical work process possible. This purely purposeful, mechanically retaining function of human workforce in the (post-) industrialized world is, since Marx at the latest, a central object of a political as well as scholarly discourse. This installation is the attempt at an aesthetic approach at this relationship of people to their machines, determined by utility and labor.